I have a fairly small brick texture I’m trying to map to a very strange Y shaped support structure. 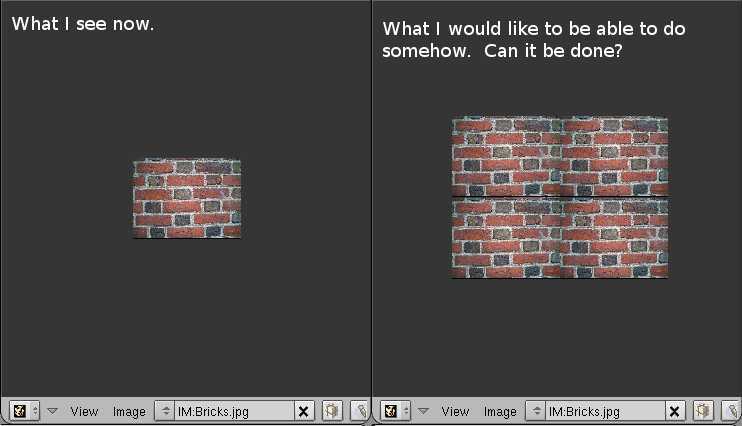 I would like the texture to repeat fairly often across the shape so that the bricks appear fairly small on the model. To do this, I’ve scaled up the UV coords in the UV/Image Editor such that some of the points fall beyond the boundaries of the texture. This makes it very difficult to edit the texture coords that fall outside the image rendered in the UV Editor panel; I cannot actually see how they are lining up with the texture. Is there any way to repeat the texture continuously in the UV/Image Editor so that I can see where points falling outside of the initial image will map onto the repeated portion of the texture? OK, found what I was looking for. Just in case someone else has the same question in the future, here is where I found the feature I was looking for. Click on the “Tile” button and specify how many x, y tiles you would like. Actually, it looks like I spoke too soon. This feature seems to continually divide the texture in half, repeating only the first half each time. For example, if I use Y: 2 for the number of Y repetitions, only the first half of the texture is repeated. I would like to have the entire texture repeated twice along the Y axis. Any pointers? Try F6, ‘Map Image’ Panel, ‘Repeat’ and set an x and y value. That is exactly the functionality I was hoping for, it’s just not where I want it. I would basically like the behavior of the Material Preview panel, except within the UV/Image Editor itself. I honestly don’t know, but if you need the texture to line up at the seams it might to better to make a custom texture image. You can save the UV unwrap, and use it as a background layer in an image editor to make a texture image that will suit your needs. EDIT - It is possible you could do this with an SVN build, though it may not work the way you want it to. If you don’t want to build your own, try downloading a recent build for your system from Graphicall.org and have a look at the ‘View Properties’ panel in the UV/Image Editor.